Guinness with thick, creamy dark stout. Is it Good for You? 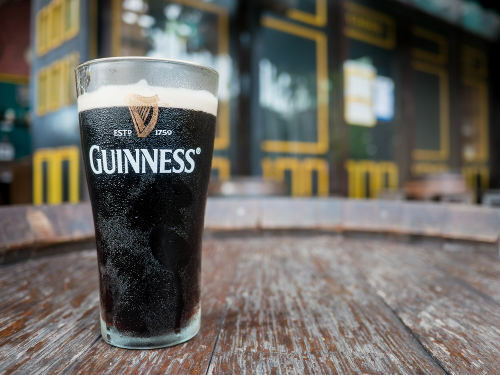 Home » Food and Nutrition » Is Guinness Good for You? If you’ve been looking for a reason to abandon your Lent restrictions, celebrating the patron saint of Ireland for a day is not only recommended, it’s encouraged. The 17th of March, St. Patrick’s Day, is sanctioned as an opportunity to eat a big meal and have a drink, so indulge yourself—but within reason, of course. One of the world-renowned ways people celebrate St. Paddy’s is with a pint of Guinness beer. The creamy, dark stout is one of Ireland’s biggest exports and, as far as beer goes, it’s relatively healthy. Now wait; you might look at a pint of Guinness and see a meal. After all, it’s got a thick, creamy texture and likely a much heavier flavor than your regular beer of choice. But the truth is that a Guinness stout is relatively low in calories and alcohol content, and the thick creaminess isn’t the result of added ingredients but rather the brewing process. Most draft beers come in at five percent alcohol by volume (ABV). Guinness, however, comes in at almost an entire percentage point less, at 4.2 percent ABV. And because the calories in beer come from alcohol, Guinness is actually lower in calories that most other draft beers. If you’re wondering what alcohol calories actually are, they’re sort of a carbohydrate hybrid. But where a gram of carbohydrates equals four calories, a gram of alcohol equals seven. All you need to know is that 12 oz of Guinness rings in at only 125 calories. The dark color and sweetness found in Guinness come from the roasted barley used in the brewing process. The thick, creamy texture isn’t achieved by adding cream to the beer but rather through a mixture of carbon dioxide and nitrogen. Most other beers just use carbon dioxide, giving them a bubbly finish as opposed to the creamy finish you get with Guinness. Of course, a pint of Guinness shouldn’t be considered a health beverage. Although there are some associated health benefits of moderate drinking—one drink a day for women, two for men—like an increase in good HDL cholesterol and lower risk of a heart attack and heart disease, there are a number of negative health effects from overdoing it. Drinking too much may lead to liver problems, cancer, depression, high blood pressure, and other complications. But if you’re in the mood to break from Lent for a moment and celebrate the day with a pint of Irish stout, then do it. It’s a great opportunity to get out with some friends, celebrate the season, and have a few laughs. Just make sure you follow up your pint of Guinness with a tall glass of water! “Guinness Calories and Other Facts About Beer,” Time, March 16, 2014; http://time.com/25145/guiness-calories-alcohol-content/, last accessed March 15, 2017. Zelman, K., “The Truth About Beer,” WebMD, August 18, 2014; http://www.webmd.com/food-recipes/features/truth-about-beer, last accessed March 15, 2017.